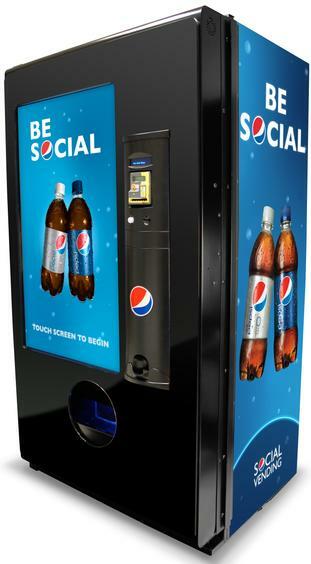 Pepsi's Social Vending System lets you buy a soda...for you or for a friend. There are few things as social as sharing a drink with someone, even if that someone is thousands of miles away. PepsiCo recently unveiled their Social Vending System, an advanced vending machine cabinet with a twist. Using a touchscreen interface you can not only buy a Pepsi soda, you can gift one to a friend. Choose the soda, enter a name and phone number, and the machine will send a text message to your friend with a special code they can use at the Social Vending System nearest them. You can even record a video message to be played when they redeem their gift. See the demo from Pepsi in the video below. Social media is just the latest fad/technology to be shoe-horned onto vending machines – but the ability to turn an electronic gift into a real beverage is pretty interesting. Like many advanced vending machines, the Social Vending System has practical technologies to backup its flashy touchscreen exterior. Telemetry sent from the Pepsi machine alerts the owner/manager about inventory levels, delivery schedules, and other pertinent information. Media content (such as ads played during downtime, songs, logos, etc) can be updated wirelessly. The customer won’t see this side of the machine’s operation, but these little advancement are what help keep these systems profitable when foot traffic is low. The point of the Social Vending System, however, may be in finding ways to keep customers coming to the machine even if they weren’t planning on stopping by. A free soda from a friend is a good incentive to seek out a Pepsi dispenser. Here’s Pepsi’s step by step explanation of how the Social Vending System works. There’s a big tie-in to their Refresh The World campaign (a community service type project), and you can assume that the actual cabinet would have video ads playing as well. The Social Vending System was recently demonstrated at the annual National Automatic Merchandising Association’s One Show in Chicago a few weeks ago. That’s nearly two years after Coca-Cola upped the ante in vending with their Freestyle machine which can dispense over 100 different Coke products from the same fountain. Here’s a (quirky) video that shows what the Freestyle can do. These new prototypes for dispensing soda are part of a larger picture. We’ve seen all sorts of new additions to vending machines in the last few years. Hitachi experimented with fingerprint scans being used instead of cash. Robots serve ice cream in Japanese amusement parks. There are even German farms that use vending machines to sell their wares. In that light, adding in some social media messaging (like Pepsi) or allowing for 100+ flavors (like Coke) seems pretty tame. Just another small upgrade to the vending technology. Yet there’s one little piece of the Social Vending System that I find really interesting and that’s the ability to send someone a digital code that they can redeem for a physical object at their leisure. We do this all the time with proper money, but seeing it happen with soda elicits a different response in me. There are echoes here of the Internet of Things, spimes, 3D printing, and other digital to physical conversions that I think are looming large on the horizon. Today you can send someone a code for a Pepsi. Tomorrow maybe they can get food in the same way or maybe a cheap gift (we see this all the time with scratch off ‘contests’ and free prizes, but the idea could be expanded to include peer to peer exchanges). I wonder if these sort of early ‘gifts’ of soda aren’t setting the stage for a world in which every digital object can be converted into a physical one at our whim. These are just the earliest signs of that phenomenon, but they still resonate with me. For now, of course, Pepsi’s Social Vending Machine isn’t about materializing objects out of thin air, it’s about selling soda. To that end, it will probably work moderately well. There’s something fun in sending gifts to friends who are miles away. Privacy concerns about giving their name, phone number, etc to Pepsi are real (though the company swears it’s not going to share that data), but such concerns are common these days. If it really bothers you to share your friend’s info, why not gift a soda anonymously. Pepsi’s machine will allow you to commit a “Random Act of Refreshment” – basically sending a soda to someone you don’t know who’s used the system in the past. Whether between friends or randomly distributed, the social sharing of soda is pretty cool. I don’t think it will be earth-shaking in its effects, but I wouldn’t be surprised for these machines to become quite popular if they ever hit the mass market. Drinking alone is sad. Drinking alone in front of a vending machine a little worse. Sharing a soda may be just the kind of social medicine the doctor ordered.